In the early modern period Scotland was one of the least-known regions of Europe. This was particularly true of the Highlands, an area that was overshadowed by myths and stereotypes that often dated back to the Middle Ages. This monograph examines the stereotyping of Scotland and the Scots and the way in which this was reflected in late medieval and early modern travellers' accounts. Special emphasis is put on the discovery and the opening up of the Highlands and Hebrides to foreign visitors. This region kept its distinctive Gaelic tradition and identity until well into the nineteenth century. The accounts of foreign visitors offer a unique insight into everyday Highland life. Travellers became eyewitnesses to the dramatic economic changes in the seventeenth and eighteenth centuries, and their first-hand accounts are valuable sources for Highland history, covering all aspects of society from clanship and the Highland economy to the locals' agricultural techniques and their customs and manners. 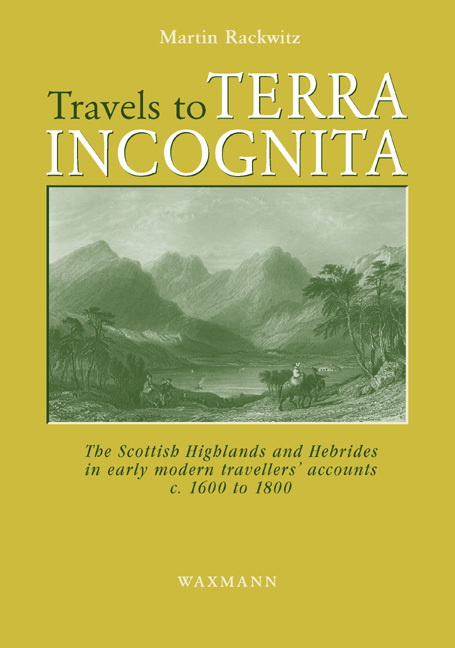 The attached CD-ROM, including 120 short biographies of travellers and 115 maps showing their individual routes, makes this study an important reference work on travel and the history of the Scottish Highlands and Hebrides. Martin Rackwitz was born in 1970 in Münster (Germany). He studied history and English literature at the University of Kiel (Germany), completing his degree in 1998. Between 1999 and 2003 he undertook doctoral research in Edinburgh, supported by scholarships from Kiel University and the German Academic Exchange Service. His thesis, awarded in 2004, examined the history of travel and travel writing in the Scottish Highlands. He now lives and works in Kiel. His main fields of research are British history and the history of German universities in the early nineteenth century. [...]in the style of a north Europaen PhD thesis, Travels to Terra Incognita represents a vast amount of scholarship, with copious amounts of information contained in its pages, and even more in the voluminous footnotes. [...] Rather than a chronological trawl through the accounts, the book proceeds thematically, having identified the main preoccupations of the various travellers in the region. [...] It demonstrates the value of an author fully conversant with the large body of secondary literature available in German and other languages on the subject of travel in the Highlands and Islands, and indeed the wider travel writing genre, and able to synthesise a vast quantity of material in a clear and methodical manner. Andrew G. Newby in: Rural History, 19. 2008. Betty Hagglund in: Studies in Travel Writing, 3. 2009.